1) PROVIDE YOU WITH A CLEAR, DETAILED, ACCURATE ESTIMATE FOR YOUR PROJECT. 2) MANAGE YOUR PROJECT WELL. 3) BUILD YOUR HOME BEAUTIFULLY. Sadly, too often, they don’t. Sometimes that is because you hired a bad contractor, but more often it’s because of a lack of experience or poor communication. BEING A GOOD BUILDER DOESN’T MAKE SOMEONE A GOOD BUSINESS PERSON OR GOOD PROJECT MANAGER. Let’s explore those three areas of expertise so you can arm yourself with the knowledge you need to get a better, more accurate estimate and have an easier, more successful remodel. – Did they confirm your meeting a few days before they showed up? – Did they show up on time to provide you with an estimate? – Did they send that estimate to you in whatever timeframe they promised? (Doing a proper, detailed estimate can take an hour or more to put together, so it’s appropriate for a busy contractor to need at least a week to send one your way). Let’s start with what it should *not* include. It shouldn’t be a simple number like “$30,000” that says “to remodel bathroom.” That’s just not enough information. Does that cover disposing of the debris from demo? Does that cover just labor, or materials and fixtures too? THIS IS THE KIND OF BID THAT DOUBLES IN SIZE OVER TIME. RUN FROM IT. While you *should* expect a clear breakdown of costs, you shouldn’t expect it to layout contractor profit and mark-ups, although some contractors do disclose that. But just like you don’t buy a blouse and ask the sales person how much the store marked it up from wholesale, you shouldn’t expect a contractor to tell you that level of behind-the-scenes information. What you *should* get is a nice long list of labor tasks, materials allowances, and a contingency amount (for those “surprises” like rot or termite damage). Ideally those three elements will be spelled out separately enough that you can compare one contractor to another. Three contractors may be suggesting very similar labor costs, but one might allow for more expensive materials, and another may not include materials in their bid at all. If you don’t know how your $175,000 bottom line breaks down, it’s hard to compare bids. Below is a generic version of a line by line estimate, and if you’d like to see a real (and really detailed) version, the folks at Palmer Residential were kind enough to share a recent contract they put together for a client. Remember, it is just as important to identify the work *not* being done as the work that *is* being done. This level of communication keeps trust levels high, everyone on the same page, and avoids nasty surprise bills later. A lot of folks have a contractor come to their home, and all they tell the contractor is “I want a kitchen remodel,” expecting the contractor to fill in the holes. That is an unfair use of their (and your) time. There is a big difference between a project that just replaces some counters and opens the wall between the kitchen and dining room, and a project where you gut and remodel the whole room, move the plumbing, add recessed lighting, and install new gas lines and venting. You want a good relationship with the contractor from day one, so come to the meeting as prepared as possible. If you really do need the guidance and advice of a contractor before you can dive in to planning, treat them like any other consultant and plan to pay for their time. They may not demand it, but they probably deserve it. If your contractor provided you with a clear and detailed estimate, odds are good that they’ll effectively communicate throughout the project. They’ll expertly manage their subs (like the electrician or plumber) so everyone shows up when planned and the project stays on time, and they’ll provide the homeowner with the tools they need to be a great partner in the project, like a list of decisions they’ll need from you and deadlines by which they’ll need those decisions. Especially on larger projects, a great contractor will prepare a project calendar that you, the contractor, and subs all can access (for example, Woodcrafters uses Builder Trend). This streamlines the material selection and ordering process and makes for more effective project management (including scheduling, document storage, messaging, and tracking/implementing change orders). The more design decisions you make pre-demo (or pre-estimate) the easier and more efficient your remodel will be. Bear in mind that you *will* have mid-project decisions (like, “ma’am, we opened the wall and discovered a plumbing stack right where you wanted your shower niche – how would you like to handle that”), not to mention the stress that comes with potential weather delays and scheduling/rescheduling subcontractors. Making material decisions early takes away a level of stress and allows both you and your GC to react to the other things better. Remember that the decision-making (both before *and* during the project) can feel like a full time job. Be prepared to put the time in and keep the decision making at least two to three weeks ahead of the project schedule. This is a team sport, and if you want the contractor to respect your time and use your money wisely, please do the same for them. A surefire budget-and-schedule killer is a client that ignores the contractor’s decision deadlines and changes their mind on tasks that are already in process. Of course, this is the end goal, right? 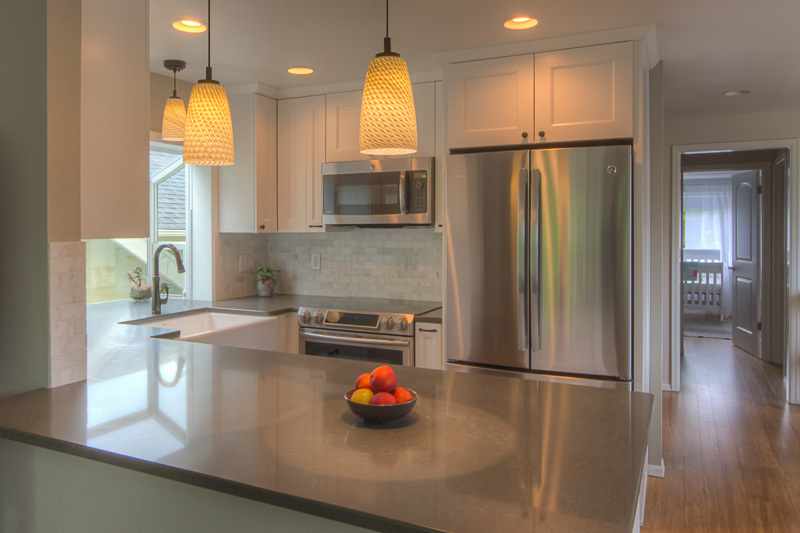 Even if you have a horror-story remodel that goes over budget and over time, and even if you hate the contractor so much you’ll never speak to them again, you hope that, in the end, you at least have a beautiful kitchen that is functional and durable. Did the contractor finish your project on time and on budget? What hours did they keep? Did they show up every day when they said they would? Did they keep a neat and tidy work environment? Was the bathroom trashed every day you’d come home? Were you happy with the quality of their installations? Think about your personal pet-peeves. Hate loud music? It’s okay to ask the referral if the contractor tended to use earbuds or play from a boom box onsite. This is *your* house – you don’t want to dread coming home each day! – BE HONEST WITH YOUR BUDGET, AND BE DIRECT AND SPECIFIC ABOUT YOUR DESIGN NEEDS, QUALITY EXPECTATIONS, AND TIMELINE. If you don’t trust the contractor, then don’t hire them. But don’t lie to them from the start – you need an honest, clear working relationship with this person. – DON’T ASK FOR A BUNCH OF REVISIONS TO THE ESTIMATE UNTIL *AFTER* YOU HIRE THEM. It’s a-okay to ask for a detailed bid while you are still comparing two or three contractors, but please don’t waste their time with lots of changes to the scope until you’ve made that hiring decision. In order to make that hiring decision, all you need are apples-to-apples estimates from about three folks. That means asking for a quote on the *same* scope of project, not changing it from contractor to contractor as you get more ideas from each one. It’s normal to change or tighten up the scope once you’ve compared your contractors and decided who you’ll hire. Hopefully this arms you with useful information for having a great project from start to finish, and hiring a contractor that helps the process go as smoothly and quickly as possible. YES, HIRING A CONTRACTOR THAT PUTS THE TIME INTO GOOD PROJECT MANAGEMENT *WILL* COST MORE UP FRONT. BUT PROMISE ME WHEN I TELL YOU IT WILL BE WELL-SPENT MONEY AND *MAY EVEN SAVE YOU MONEY* IF IT AVOIDS DELAYS AND OTHER COST-OVERRUNS. Not to mention the stress you’ll avoid with a well-run project. Seriously. If you have any other questions on getting an estimate or hiring a good general contractor, don’t hesitate to ask those questions below. Have a great contractor you’d like to recommend, or a horror story you’d like to tell us? Share that below too! We can all learn from each other! MAY YOUR HOME (& YOUR REMODEL EXPERIENCE) ALWAYS BE HAPPY!